Water-based Ink for Intaglio & Relief - Akua Intaglio is a printmaker’s dream come true. Originally formulated for intaglio printmaking, this ink can also be applied with a brayer for relief printmaking, monotype, and collagraphs; and it will print from any plastic, wood, linoleum or metal plate. They contain no driers, offering a long working time for monotype or wiping the plate. 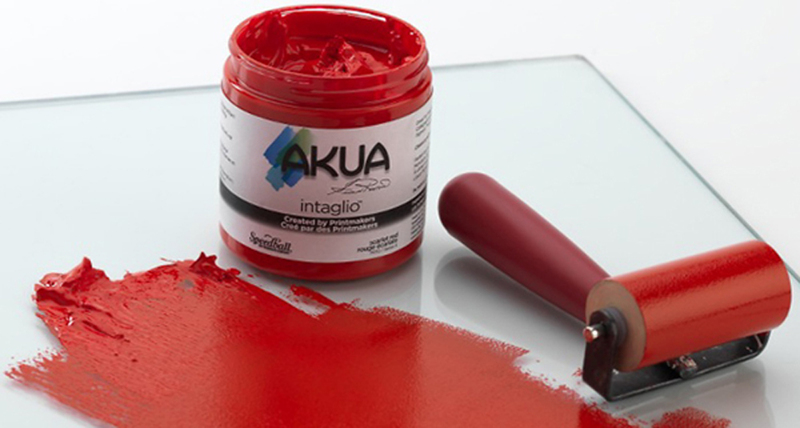 Made with Soy and Light fast Pigments - Akua Intaglio is a soy based ink made with the same high quality lightfast pigments as Akua Liquid Pigment. It has a thick consistency with minimal water content. Clean up with soap and water - Akua Intaglio ink cleans up easily with a dry rag followed by soap and water. Inexpensive liquid dish detergent can be used. Never use toxic solvents.agian. Permanent - Prints can be re-soaked immediately after printing if handled carefully. Once the print is dry, Akua-Intaglio is permanent. Never Skins or Hardens in the Jar - Ink will never skin or harden in the jar or on the ink slab, so no ink is ever wasted. Easy to Use - Wiping the plate with Akua Intaglio is easier than wiping oil-based ink. Less wiping pressure and time is required. Excellent Results - Wipes nice and clean while the paper picks up the ink efficiently. Option To Print on Damp or Dry Paper - Choose to print on dry or damp paper according to what may be best suited for your technique. Plates with greater tonal value, deeply bitten or raised surfaces require dampened paper. It may not be necessary to dampen paper for shallow bitten plates with high contrast images. Monotypes print best on dry smooth paper.